Facelift, or rhytidectomy is a type of cosmetic surgery procedure used to give a more youthful appearance. It usually involves the removal of excess facial skin, with or without the tightening of underlying tissues, and the redraping of the skin on the patient's face and neck. UV radiation and stress are some of many factors that contribute to changing facial skin and getting wrinkles. The first signs of aging appear on the face and neck area. For example the fold between the upper lip and nose (nasolabial fold) deepens, jaw is not outlined as clearly as before, but slackens and a jowl appears, there will be folds and excess skin. Facelift can help with these kinds of problems. Certanly, facelift cannot stop the aging, but it can make face looking more youthful and "fresh". Facelift removes excess fat and skin, tightens facial muscles under the skin. Facelift is a very individual procedure that depends on the wishes and possibilities of the patient, facial structure and the surgeon's technique. The surgeon has to evaluate the condition of the face (and skin) thoroughly. Younger patients (30-40 years old) may only need a slight facial skin correction, however, older patients' (50-60 yeas old) operations are more extensive and their recovery takes more time. In the traditional facelift, an incision is made in front of the ear extending up into the hairline. The incision curves around the bottom of the ear and then behind it, usually ending near the hairline on the back of the neck. After the skin incision is made, the skin is separated from the deeper tissues with a scalpel or scissors (also called undermining) over the cheeks and neck. The incisions will be behind and in front of the ears, near the hairline. At this point, the deeper tissues can be tightened with sutures, with or without removing some of the excess deeper tissues. The skin is then redraped, and the amount of excess skin to be removed is determined by the surgeon's judgement and experience. The excess skin is then removed, and the skin incisions are closed with sutures and staples. If incisions are of the ears, lift will affect the lower part of the face, cheeks, lower jaw, the area below the jaw and neck. Therefore it is not effective for removing wrinkles around the eyes and on the forehead. An upper lift is recommended for that. If the whole face is problematic, surgeon will perform a full facelift. A cannula might be inserted under the skin to the back of the ear after the surgery, by which tissue fluid and blood that have gathered under the skin are drained. Finally, a bandage is tied around the head, which reduces postoperative swelling. eyelid surgery,beauty injections, other kinds of skin rejuvenating and peeling procedures. The whole procedure usually takes two to three hours, but it still depends on how extensive the surgery is. The result is a smoother and more firm facial skin and an overall improvement to your looks and profile. It may be necessary to stop taking some medications; you should also stop smoking for some time, since it hinders postoperative recovery. In case you want to hide the fresh scars after the surgery, people with short hair should grow their hair beforehand. You should also think about some support before after the surgery. You can take painkillers if you need after the surgery, but mostly people just feel discomfort, not pain after a facelift. Your face may also be numb, but this will pass. Your face may probably be malformed for the first few weeks after the surgery due to swelling, this is absolutely normal. You can see the final result after half a year or a longer period of time, when the scars are barely visible. The bandages will be removed after at least five days, sutures after about a week – it all depends on the concrete patient. You should rest at home for at least two weeks after the surgery. During that time you should avoid strenuous activities, sauna and drinking alcohol. You should avoid direct UV radiation for a year. Facelift makes you so to say look fresh, but does not stop aging. So one must take regular care not only on appearance, but on everyday life: diet, level of phisical activities, etc. 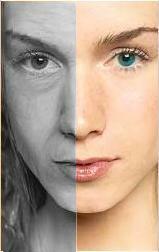 A pale skin type hereditary from your parents is prone to be wrinkled sooner and quicker. Pale skin is also thinner, therefore the danger of getting sunburns is greater. The more the sun damages the skin, the faster the skin ages. However, not only people with pale skin type should protect their skin, dark-skinned people should also sunbathe moderately. Pale skin is inevitable, but you should use special lotions to protect you from UV radiation. The pollutedness of the environment (exhaust fumes and dust) and temperature (either a very cold or very hot weather, strong winds as well) affect the skin's aging process – however, there are skin protection lotions for these abiotic factors too. In addition to hereditary pale skin, a person could have dry skin type, which ages many times quicker than oily skin. It is important to use skin care products that consider different skin types and therefore either moisturize or reduce oiliness. In any case, skin humidity decreases the older you get and as a result skin's suppleness decreases and skin becomes sagging. Duration of the surgery: Depends on how extensive the surgery is, usually 2-3 hours. Inpatient/outpatient: Usually outpatient, but an overnight inpatient stay is recommended. Anesthesia: Local or general anaesthesia. Recovery: Depends on how extensive the surgery is. It is recommended to take at least two weeks off from work. You should wait 2-3 weeks with strenuous activities. The swelling usually goes down after three weeks. Possible side effects: Temporary swelling, hematoma in the incision area, bleeding wounds, dry skin, sensitivity and tenderness. It might be possible that men would have to start shaving behind their ears, where the beard-growing skin will be stretched. Scars: The scars will be in places that are hardly noticeable and disappear in time. Risks: Like with every major surgery, this also includes risks such as hemorrhage, infection, scar tissue and reactions to anesthesia. Hematoma, injuring facial nerves and changes in the hairline are also possible.